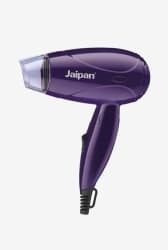 The Jaipan JPHD0027 1000 W Foldable Hair Dryer has a range of features to enable you to easily dry your hair within a short span of time. The turbo function gives the user professional drying power. This dryer is designed to distribute the heat evenly, even at high temperatures so as not to damage your hair.